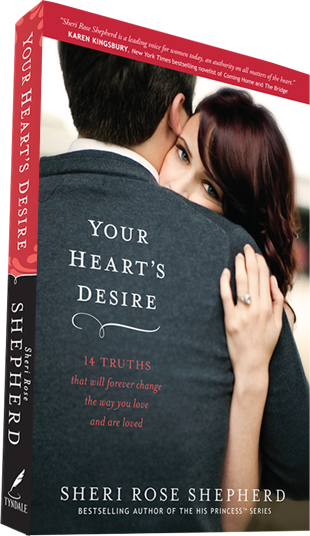 Recently, I got the opportunity to read Your Heart’s Desire by Sheri Rose Shepherd. I came to this book expecting to learn something new about marriage. The book promises, on its cover, that it contains “14 truth that will forever change the way you love and are loved.” With a promise like that, you would think that there would be some earth-shattering advice within its page. What I found, though, was that the book gave a lot of simple advice that bordered dangerously close to cliche. It wasn’t profound or especially deep. I don’t think the author came in claiming to hold some secret truths to changing all marriages. She was refreshingly honest and open and gave advice that would be helpful. It’s as if the person who wrote the back cover didn’t read the book and tried to make this author’s valiant attempt to encourage ladies into a book that she never intended it to be. That said, I appreciated the author’s honesty, her transparency, and her willingness to share the harder parts of her own story in an effort to help other women. Having been married a much shorter time than she has been, I hesitate to do anything but applaud her efforts to teach younger women from her own experience, to minister to those who are hurting, and to give hope to others. However, there were some points that she made that I felt were actually detrimental to women who are seeking wisdom on godly marriage. After doing a beautiful job of explaining a man’s leadership in marriage and encouraging women to gladly accept the covering that their husband’s authority lends (which is completely biblical! ), she diminishes her own enthusiasm for doing so by using a quote from a popular, secular movie — “The man is the head, but the woman is the neck. And she can turn the head any way she wants.” In other words, go on and be the godly wife Scripture calls you to be, ladies… you can still be in charge of your man. Perhaps this wasn’t her intention, but this was a point that could be gathered from what she wrote. At another point, she criticizes another author (one whom I particularly admire) by saying this — “Christian leaders are overwhelmed by the miserable marriages they are trying to help. They are doing the best they can but feel as if they have run out of answers. They have come up with some pat answers in an effort to bring relief to all the loveless and lonely marriages in the church. They’ve settled for phrases like, ‘Marriage was not made to make us happy. It was made to make us holy,’ or ‘Marriage was never intended for romance. '” I totally believe that there are pastors and leaders out there who give “pat answers,” but lumping them all together in a category is wrong. And a pastor who truly studies, knows, and teaches the word of God is NEVER out of answers! She takes offense with the view expressed in the quotes she listed (see above), using the Song of Solomon to show readers that God intends marriage to be intensely romantic, exciting, and thrilling. If all seasons of marriage were like the Song of Solomon, we would all be EXHAUSTED. I say that as someone who really does love her husband with that kind of intensity, but I’m betting that there will be a day that I don’t want to spend all day loving him like Solomon’s young bride loved him. Just saying. Using just one portion of Scripture to make a point while ignoring the whole teaching of Scripture — that life is less about my happiness and more about making much of and glorifying God — is unhelpful, especially to, what the author calls “loveless and lonely marriages.” I totally agree with her that marriage can and should make people happy, but we’re selfish, self-centered people. Therefore, as God uses marriages (those that are difficult, those that aren’t so difficult) to make us more holy and less selfish, He makes those marriages happier because He changes the people in them. A happy marriage built on anything less than being made more like Christ misses the point entirely. I can think of a few books on marriage that I would recommend before this one Sacred Marriage and Sacred Influence by Gary Thomas, Love and Respect by Emerson Eggerichs, The Five Love Languages by Gary Chapman, and The Peacemaker by Ken Sande (not a marriage-specific book, but VERY applicable to marriage) are ones that come to mind automatically. Many thanks to Tyndale House Publishers for providing me with a free copy of this book in exchange for a review. All opinions expressed are mine entirely.